George Brandis, Australia’s attorney-general, reportedly commented during high-level security meetings in Jakarta between Australian and Indonesian ministers and security officials that he has no doubts at all that the terror-group, ISIS (Islamic State in Iraq & Syria) is seeking to establish a distant Caliphate in Indonesia. “Isis has ambitions to elevate its presence and level of activity in Indonesia, either directly or through surrogates. You’ve heard the expression the ‘distant caliphate’? ISIS has a declared intention to establish caliphates beyond the Middle East, provincial caliphates in effect. It has identified Indonesia as a location of its ambitions,” Brandis warned. 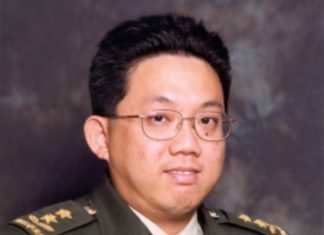 If Brandis’ warning are true, not just Australia and Indonesia, but the region as a whole, including Singapore, becomes very vulnerable to ISIS-inspired terrorism. And his warning are not unfounded. Indonesian police recently foiled plans for a suicide attack in Jakarta and arrested radicals linked to ISIS. In September of this year, Malaysian police arrested three individuals over their suspected involvement in a potential terror attack in Kuala Lumpur. 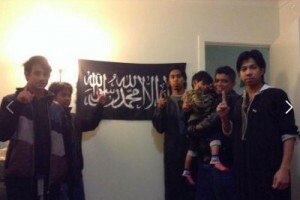 In Singapore, 2 men have been placed in detention without trial lately for planning to join ISIS. A Singaporean. 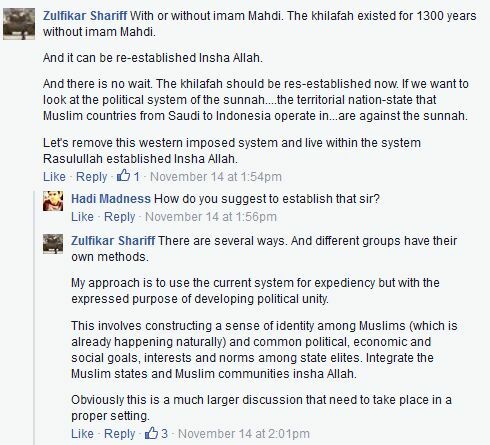 Zulfikar Shariff, who is a PhD student in La Trobe University in Melbourne, Australia, has openly supported an ISIS-inspired Caliphate to immediately replace the western-ideology imposed secular States in our region. A local Ustaz, Dr Mohamed Ali, has however reportedly clarified that it is no longer a religious requirement for Muslims to create an Islamic caliphate. He reportedly said that even if ISIS uses the Quran and Sunna to teach terror, they are not the true teachings of Islam. The Ustaz urged Muslim not to be confused by extremists who use religion to justify an ideology or doctrine to call them to ISIS-like terrorism.